Moray eels, or Muraenidae, are a family of eels whose members are found worldwide. 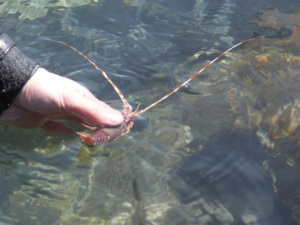 The approximately 200 species in 15 genera are almost exclusively marine, but several species are regularly seen in brackish water, and a few are found in fresh water. The moray eel can be found in both freshwater habitats and saltwater habitats. 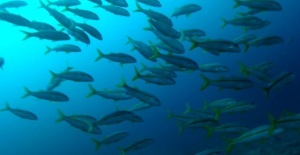 The vast majority of species are strictly marine, never entering freshwater. Of the few species known to live in freshwater, the most well-known is Gymnothorax polyuranodon. Within the marine realm, morays are found in shallow water nearshore areas, continental slopes, continental shelves, deep benthic habitats, and mesopelagic zones of the ocean, and in both tropical and temperate environments. Tropical oceans are typically located near the equator, whereas temperate oceans are typically located away from the equator. Most species are found in tropical or subtropical environments, with only few a few species (e.g., Gymnothorax mordax and Gymnothorax prasinus) are found in temperate ocean environments. 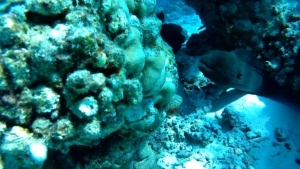 Although the moray eel can occupy both tropical oceans and temperate oceans, as well as both freshwater and saltwater, the majority of moray eels occupy warm saltwater environments, which contain reefs. 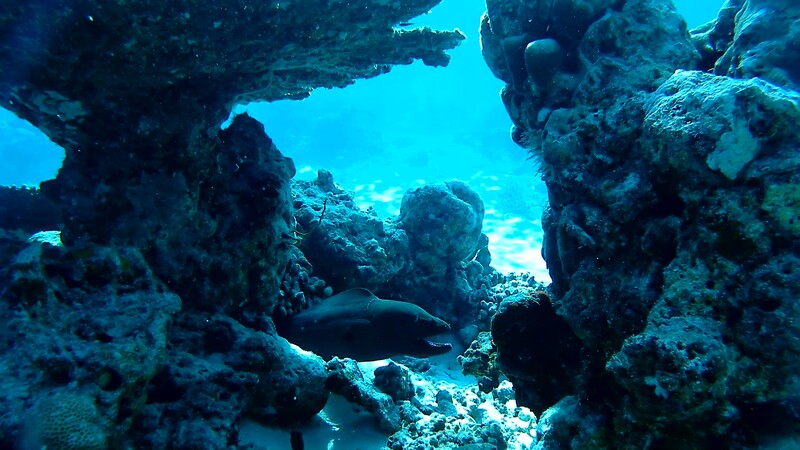 Within the tropical oceans and temperate oceans, the moray eel occupies shelters, such as dead patch reefs and coral rubble rocks, and less frequently occupies live coral reefs. 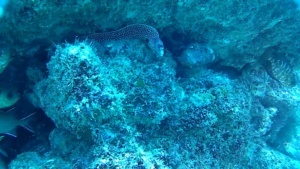 The smallest moray eel is probably Snyder’s moray (Anarchias leucurus), which attains a maximum length of 11.5 cm (4.5 in), while the longest species, the slender giant moray (Strophidon sathete) reaches up to 4 m (13 ft). The largest in terms of total mass is the giant moray (Gymnothorax javanicus), which reaches 3 m (9.8 ft) in length and 30 kg (66 lb) in weight. The English name, from the early 17th century, derives from the Portuguese moréia, which itself derives from the Latin mūrēna, in turn from the Greekmuraina, a kind of eel. Morays are opportunistic, carnivorous predators and feed primarily on smaller fish, octopuses, squid, cuttlefish and crustaceans. 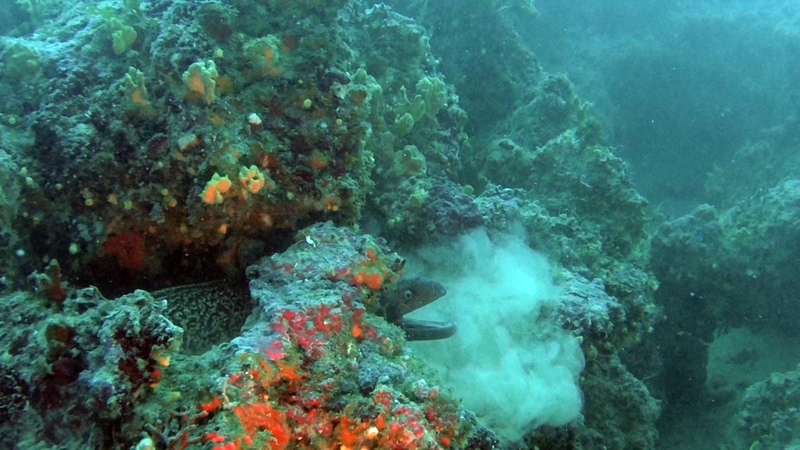 Groupers, barracudas and sea snakes are among their few known predators, making many morays (especially the larger species) apex predators in their ecosystems. 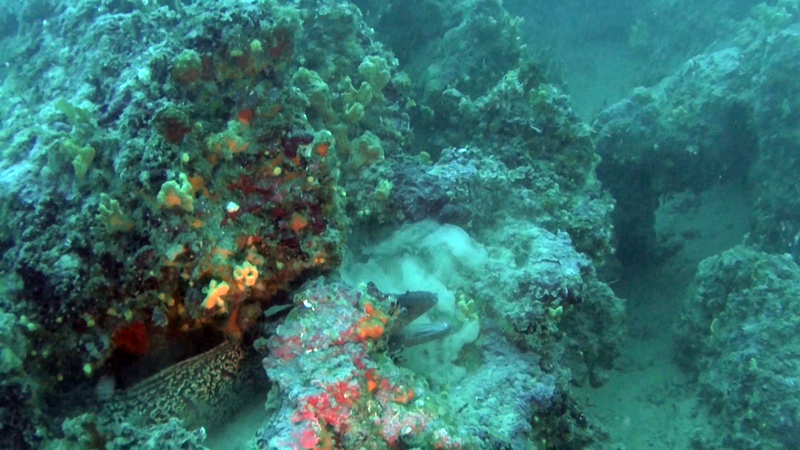 Reef-associated roving coral groupers (Plectropomus pessuliferus) have been observed to recruit giant morays to help them hunt. The invitation to hunt is initiated by head-shaking. 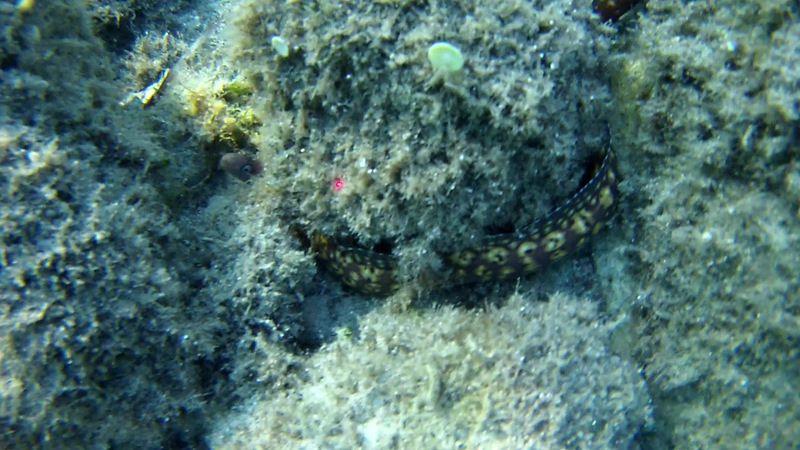 This style of hunting may allow morays to flush prey from niches not accessible to groupers.